I have been trying to get a test drive of the Prius Plug-in Hybrid for a long time now but until now Toyota have never made one available at any event that I attended. 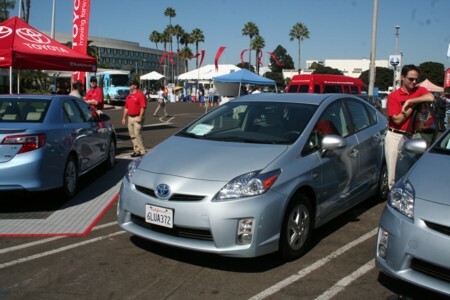 At this year's Santa Monica Alt Fuel Vehicle Expo Toyota had not one but four plug-in Prius doing duty for test drives. I made this my first stop. I was a little bit disappointed to see that the car was one of the current test vehicles, not the 2012 production car. The easiest way to tell this is to look at the position of the charger port which is on the front Left fender for the test vehicles but has been moved to the right rear for the production version. Still, they will pretty much drive the same and the frustratingly short test circuit at least gave me a bit of a feel for the car. Apart from the charge port there is very little to distinguish the Plug-in from the current generation 3 Prius. While I drive a generation 2 Prius almost every day I have never driven the generation 3 car so that was also an experience for me. Toyota had a nice little sunshade where people could sit out of the sun while waiting, but I didn't have to wait too long before one of the Toyota employees came over and asked if I was ready to take a test dive. He led me over to one of the vehicles that was attached to a small generator for charging and asked me to wait for a few moments while he unplugged the car and checked the level of charge. 13.5 miles of electric range he announced then let me climb in the drivers seat. The interior is very similar to my Gen 2 Prius but the layout is a little bit different. There is still a small screen in the center but this is now dedicated to the navigation system. In this car the system was just a mock-up and didn't appear to work. The energy flow display that I use most of the time when driving has been moved to the left end of the instrument cluster but that shrank the graphics making it a little harder to read. Starting the Plug-in Prius is the same as with the conventional Prius, put your foot on the brake and press the start button. The shifter has been moved from the dash to the center console and looks more like a regular shifter but still works in the same way as the joy stick. You shift it to drive or reverse and it click back to center. I had to wait to pull out while a whole herd of Nissan Leafs came by but finally I was able to step lightly on the gas pedal and move slowly out to the exit being careful to avoid the crowds of people looking at the vehicles on display. Once on the road the Plug-in drives pretty much the same way my regular Prius drives. I had heard that you had to be very careful to keep the car in electric only mode but I didn't have any problems at all. The course consisted of a square about half a mile in length around the Santa Monica Civic Center that was negotiated with 6 right turns including the exit too and from the parking lot. The traffic in that area is pretty heavy so there was no opportunity to really punch the throttle but I was able to accelerate about the same way I would most of the time with my Prius and over the whole course I was unable to get the car's ICE to start. I did the whole half mile circuit in EV mode. On returning to the Civic Center parking lot I eased the Plug-in into one of the parking spaces reserved for Toyota test drive vehicles and hunted around for the park button. The button was on the dash below the power button but its location was obscured by the steering wheel so I had to move move my head to find it. You don't really need to press the park button, if you power off the car automatically goes into park but I try to make it a habit to hit the park button so that I don't forget to put it in park when I am going to sit for a while with the car still on, such as when I am waiting for my carpool buddies. The driving experience for the plug-in Prius is pretty much the same as that of the regular Prius. I hope to be able to get a longer test drive in the near future since the plug-in Prius will possibly be my next car. Toyota will begin taking orders for the plug-in Prius later this month with deliveries scheduled for March 2012. Price starts at a base price around $32000 and will be just under $40,000 for the top of the line model.